Friedman, Domiano & Smith, Co., L.P.A., is a highly respected, AV®-rated, Cleveland, Ohio personal injury law firm with a statewide practice. We devote our practice to representing plaintiffs who have suffered catastrophic injury or death, and we have earned a reputation for achieving excellent results for those clients. Among our areas of practice are medical negligence, products liability, workplace injuries, trucking and car accidents, and nursing home abuse, but we have the experience and resources to take on almost any tort action involving severe injury or death. Our experience ranges from single-victim acts of negligence to mass torts and multi-district litigation. Our attorneys are active trial lawyers and appellate advocates. Our philosophy is to prepare every case under the assumption that it will ultimately be decided by a jury, and the lawyers of Friedman, Domiano & Smith are always prepared to stand before the court. We take a comprehensive approach to every case, and handle each one from investigation to verdict, through the last appeal. Jeffrey Friedman, along with his partners and associates have been innovators and trendsetters in Ohio law for more than three decades. We practice in every state and federal court in Ohio. Whether your client’s cause of action occurred in Cleveland, Columbus, or anywhere else in Ohio, you can depend on us. Major personal injury cases require an enormous expenditure of time and money, and it may take years to achieve a return on this substantial investment. It can be a risky proposition and heavy financial burden for a lawyer to take on a single plaintiff’s case. If you are an attorney or a firm that does not routinely handle contingency cases, or if you simply do not have the time or inclination to give a catastrophic injury case the attention it demands, please contact Friedman, Domiano & Smith. While we handle catastrophic injury cases, we are able to handle anything from car accidents to workplace injuries. We have the experience and the resources to evaluate your case, and then work with you through final resolution. Sometimes a resident of another state is hurt while in Ohio. Other times, an Ohio resident seeks counsel from an out-of-state attorney who has particular experience fitting the client’s personalized legal needs, but who is not licensed to practice in Ohio. Or, there may be times when it would be beneficial to file your case in an Ohio state or federal court when your client has a choice among several proper venues. We are always glad to discuss these legal issues with other attorneys, and to provide our analysis to help you decide where to file your case. Should you decide to file in Ohio, we will support your motion for admission pro hac vice and work closely with you throughout the case. Or, if you prefer, we will take full responsibility for the case, relieving you of worry about idiosyncratic rules of procedure and foreign law, as well as the burden of frequent travel to a far-off venue. Ohio’s Statute of Limitations is generally two years in personal injury cases and one year in nursing home negligence cases and medical malpractice cases. If you are an out-of-state or out-of-county attorney with a possible cause of action in Ohio, contact us as soon as possible. 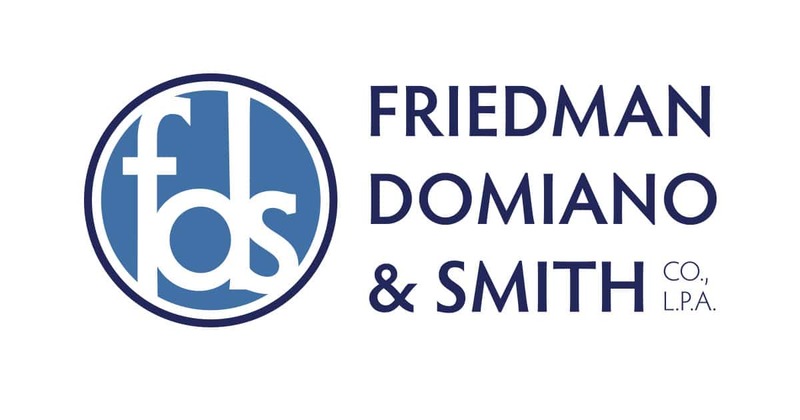 We are never a “silent partner.” At Friedman, Domiano & Smith, if we put our name on a case, we will be actively involved in every stage of the litigation. Our fee-sharing arrangements are negotiated on a case-by-case basis, and reflect the high level of involvement and experience we bring to the case. Agreements are based on many factors, including the relative participation of each firm in the day-to-day conduct of the case, provision of administrative support services, and division of expenses. If you prefer not to remain actively involved, we will take full responsibility for the case. All fee-sharing agreements are designed to be in full compliance with the Ohio Rules of Professional Conduct. We take our professional reputation seriously, and strive to conduct our practice in accordance with the highest ethical standards of our profession and society; we expect that our co-counsel will always do the same. Cleveland, Akron, Canton, Elyria, Painesville, Jefferson, Chardon, Lake County, Cuyahoga County, Summit County, Stark County and Lorain County.